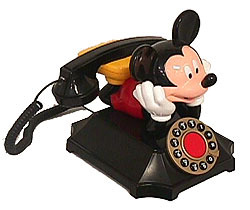 The Classic Mickey Mouse Desk Telephone makes a perfect gift for any Disney fan! This adorable Mickey Mouse M.C. 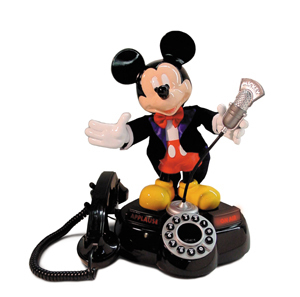 Animated Telephone features Mickey as a radio talk show host. Dressed in a black "velvet" tuxedo with tails & his red shorts and red bow tie. He holds the microphone in his left hand. The phone rings ... Mickey Mouse pulls the mic to his mouth and responds. When listening to his talk show callers, Mickey moves the microphone back from his mouth. The signs on the base of the phone will "light up" with "On Air" and "Applause"!! Ringer has real "voice" sound using Mickey's voice! 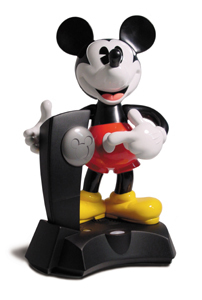 Now you can enjoy your favorite Disney Character, Mickey Mouse, in this newly designed 900 MHZ cordless telephone. With Mickey dressed in his classic colors of red and black, this phone will add convenience and charm to just about any room in the home. When the phone rings, Mickey will move and talk in his unique, yet charming original voice. 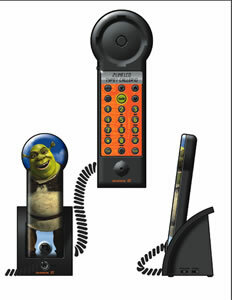 The perfect phone for the children's bedroom as well. What a great gift idea! Minnie Mouse will speak when the phone "rings"! 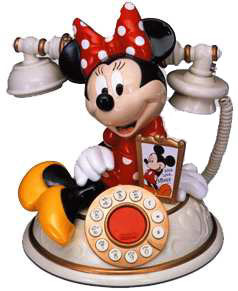 This telephone shows Minnie Mouse as the phone stand. Minnie has on her trademark red polka dot dress and hairbow with her yellow shoes! Next to her on the phone base is a picture of Mickey Mouse. • Ringer has real "voice" sound with 5 sayings! 2. "I wonder if it's for me?" 4. "But it could be for you!" 5. "Oh well, guess they'll have to try again later! 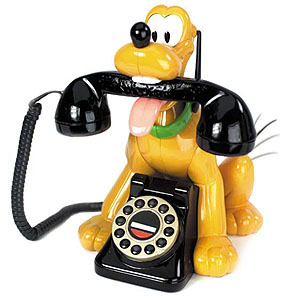 With an incoming call, Pluto will wag his tail, bark and whimper as Mickey Mouse gives him commands. Redial and volume control. 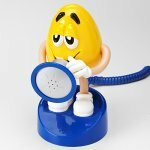 Get nutty with your telephone fashion with this M&M Megaphone. 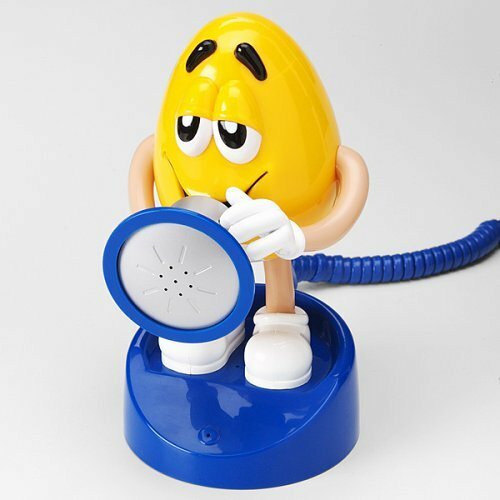 Single-piece design features the yellow peanut M&M character holding a megaphone. When the phone rings, simply pick it up and hear the caller through the megaphone. Touchtone keypad is located on underside of phone. 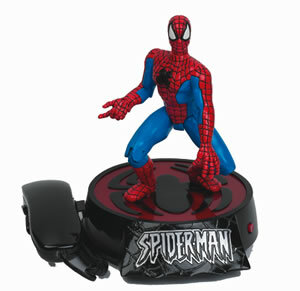 Features include flash, redial, and ringer and speaker volume controls. 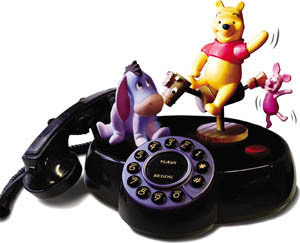 Pooh and Piglet move and talk with incoming calls or with the push of the Demo button. 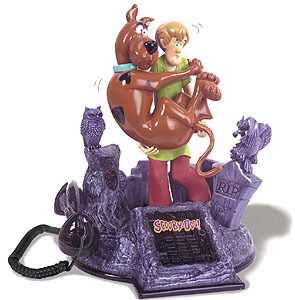 Animated talking phone features Scooby Doo and Shaggy which come to life with an incoming call or the touch of the demo button, conventional or animation ringer. Spooky sounds will come from the phone while the eyes of the “creatures of the night” light up.